Two weeks ago, Susie Hammond read about the 78 people pardoned by President Barack Obama and the 153 sentences he commuted, a record number of clemency acts granted by a U.S. president in a single day. Ammon Bundy was a surprise visitor to the Hammonds’ house in Burns in November 2015. Bundy wanted the father and son to refuse to return to federal prison in January. In stark contrast to Bundy who has chased the spotlight, Dwight Hammond is a quiet, private man. He had already served three months in prison and Steven Hammond had served a year. But a judge had resentenced them after prosecutors successfully appealed the lighter terms in favor of the mandatory minimum of five years for arson. The two had resolved to report to prison without fanfare and shield their family from further controversy, Susie Hammond said. After he dropped in on Susie Hammond, Bundy went to work pleading the family’s case. He flooded the Harney County Sheriff’s Office with emails and met with the sheriff, urging him to step in to keep her husband and son out of prison. He planned a large march through Burns and urged supporters to take a “hard stand” against the government. Bundy created enough of a stir that the lawyer for Hammond Ranches Inc. sent a letter to Sheriff Dave Ward, assuring him that the Hammonds would turn themselves in as promised on Jan. 4. Susie and Dwight Hammond were aware of the march planned for them on Jan. 2. But Susie Hammond said the prospect terrified them. They weren’t sure who to trust. Protesters march along Court Avenue in Burns on Saturday, Jan. 2, 2016, to show their support for the Hammond family. A crowd of about 300 people paraded to their home. Dwight Hammond stepped out briefly to talk to Ammon Bundy. They shared a prayer and Susie Hammond accepted a bouquet of flowers. That night, Bundy and about 20 supporters seized the Malheur refuge. Word of the takeover got back to the Hammonds about 8 o’clock that evening. Susie Hammond said Bundy hadn’t shared his plan with them beforehand. The next morning, father and son flew to California, to report to federal prison at Terminal Island in San Pedro. There was no farewell party. They were determined to follow through on their plans and hoped that getting out of Burns also would tamp down the tumult they were caught up in. Of course, that didn’t end up working. Left behind was Susie Hammond. Curious about what was happening at the refuge as the occupation entered its first week, then second and finally its sixth week, she received regular reports from friends and neighbors. The armed protest began Jan. 2 and ended Feb. 11 with the surrender of four holdouts to FBI agents. In early April, she underwent hip replacement surgery. As she was recovering, she suffered a complication, a piece of her right hip bone broke off. She was hospitalized overnight but doctors decided to let the bone heal on its own, hoping to put off another surgery. Now she uses a wheelchair to get around the house, sometimes struggling to maneuver the chair through tight corners. Mementos from her family’s long ranching history fill the place: a bronze calf greets visitors in the entry, a rifle hangs above the living room window, cowboy ropes are draped on a mantel in the dining area and the latest editions of Range magazine grace a living room table. “Log it, graze it, burn it,” reads a bumper sticker plastered on the refrigerator in her small kitchen. Her daughter-in-law, Earlyna Hammond, married to Steven, remains at the ranch. A black metal silhouette of a cowboy riding a horse behind three black cows and a calf greets visitors to Hammond Ranches, reached by a long gravel road about 50 miles southeast of Burns. The property abuts the Malheur National Wildlife Refuge, with an expansive view of the fault-block Steens Mountain and surrounding wilderness. 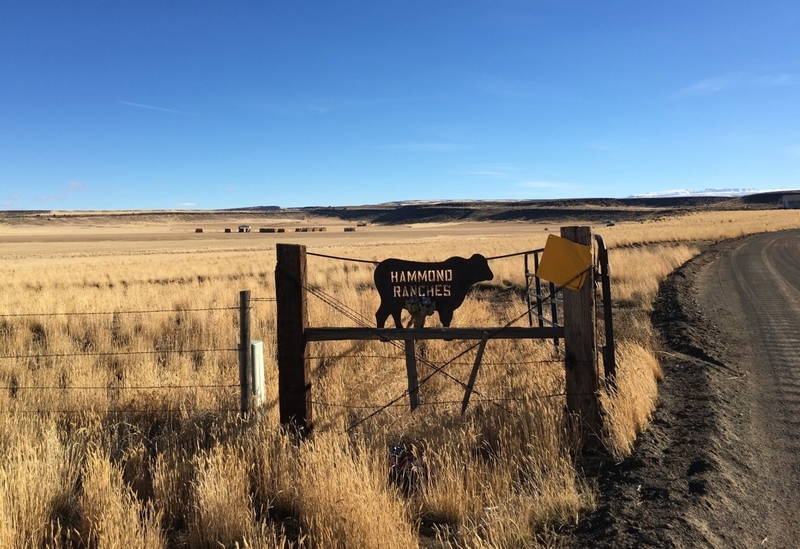 Hammond Ranches Inc. has operated on a combination of private and public land — 12,872 acres of deeded territory and another 26,421 acres on grazing allotments before the federal government curtailed its permits. Dwight Hammond Jr. sent a letter to The Oregonian/OregonLive from federal prison saying he’s aware some people in Burns and Harney County believe Ammon Bundy exploited his family, but he doesn’t feel that way. He said he understands Bundy’s frustration with the government and his desire to come to Burns. Hammond reiterated what he said on the day that Bundy’s march of support stopped at his house on Jan. 2. The family breeds its own cows with its own bulls, tends to the birth of the calves in the spring, moves the herd through pastures in the spring and summer, grows its own hay and sends the majority of the calves to market in the fall. The family hired a ranch manager to tend to the business while Dwight Hammond and Steven Hammond are away. Earlyna Hammond tries to bring the children — two sons and a daughter — to visit their father on birthdays and holidays, recently returning from a pre-Christmas visit, but Susie Hammond has gone to the prison only once. Her September trip — a four-hour drive to Boise and then a flight to Los Angeles — proved too difficult. She had a hard time seeing them in such a setting. The men, used to the wide open spaces of the high desert, live in a barracks-style building and share a bunk. Steven Hammond, who has the top bed, does carpentry work in a prison wood shop; his dad has grounds-keeping duties. Susie Hammond’s niece in the Los Angeles area visits them most often. Susie Hammond talks to her husband almost every night, but shares little, not wanting to worry him. She has longtime friends who check on her daily; oldest son Rusty Hammond, 52, of Lake County, isn’t too far and talks to her once or twice a day. He talks by phone to his father. Attorney Kendra Matthews asked for mercy for Hammond, citing his “high character,” longtime service to his community, the “unfortunate severity of his punishment,” his trial judge’s support and his family situation. Hammond is asking the president to to reduce his sentence, either totally or partially, though it wouldn’t change his conviction. A petition for son Steven is expected but hasn’t been filed yet. Even Sheriff Dave Ward, who hadn’t backed the family publicly before or during the occupation much to Susie Hammond’s still-raw anger, wrote a letter. “I did not want to see them return to prison,” the sheriff wrote. By the end of this year, Dwight Hammond, now 74, will have served a year and three months in prison for a single ranch fire in 2001, his lawyer noted. Hammond set a prescribed burn on about 300 acres of his own land that then traveled onto Bureau of Land Management property and burned an additional 139 acres, his lawyer wrote. He said he was trying to fend off invasive species. Prosecutors argued the fire also was to cover up illegal deer poaching and got out of control, placing firefighters who had to be airlifted out of the area in grave danger. “They lit this fire to cover up their crimes,” said Amanda Marshall, Oregon’s U.S. attorney when the conviction and appeal occurred. The federal pursuit followed years of permit violations by the ranchers and fires set, and they never accepted responsibility, Marshall said. Steven Hammond was convicted of arson for two fires. Her office appealed the lighter sentences because she said the trial judge didn’t have discretion to depart from a mandatory minimum sentence. The Hammonds could have faced less than a year in prison under a plea offer they declined, she said. Dwight Hammond’s lawyer pointed out in the petition that he and his son faced other sanctions. They paid $400,000 to settle a civil suit brought by the government and are having a hard time sustaining the cattle operation because of the grazing permit denial. The ranch recently lost the first stage of the appeal – a request to put the permit denial on hold while they argued the case. Ammon Bundy and supporters often invoked the names and prison sentences of Harney County ranchers Dwight Hammond Jr. and son Steven Hammond as examples of what they said was “overreach” by the federal government. Then Dwight Hammond made his own emotional plea for release. Susie Hammond, the love of his life, runs the show. She’s always taken care of him, their sons and now seven grandchildren, he said. They’re not young, he noted and wrote about her physical setbacks. He knows his wife has friends to look out for her, but she wants to remain independent. Dwight Hammond Jr. on Jan. 2, 2016, at his Burns house. If her husband serves out his full sentence, she’ll be 79 when he gets out. “I always think worse case scenario so I won’t be disappointed,” she said. But she does hold onto a glimmer of hope that her husband and son may have a better chance with the new administration. She’s counting the days until the inauguration. As for Bundy, Susie Hammond chuckles when she looks back at how she once viewed his heavy focus on prayer with a bit of unease. She would welcome any sort of intervention – divine or otherwise. I stand with the Hammonds and the Bundy’s! They are in my prayers always! As are all peoples under persecution from this tyrannical government! The occupiers of the Malheur Refuge are criminals. I agree with the these people. Mrs Hammond should not be punished. My prayers are with them.